Taking you deep down under the ocean on a quest for long-forgotten treasure, Spinomenal created a 5-reel 3-row 50-payline video slot machine with Shifting Reels, Extra Wilds, Free Spins, Win Multiplier and 4 different Bonus Games. 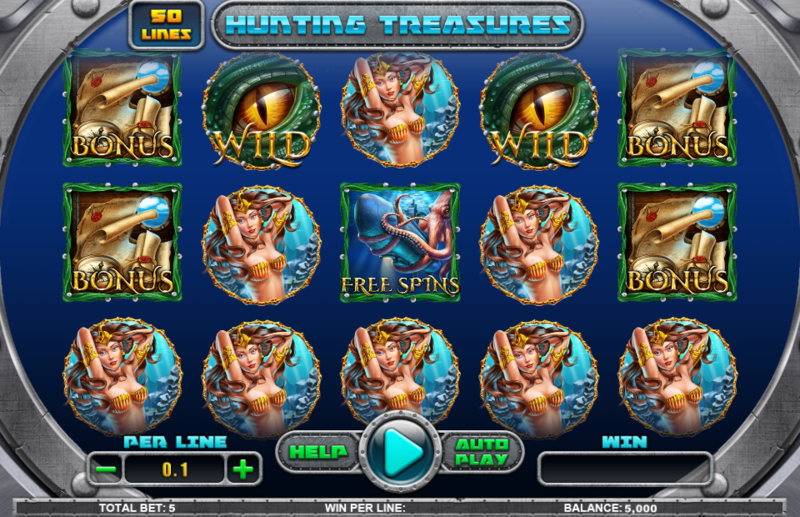 The Hunting Treasures free play mode is where you can learn how to win a 200-coin jackpot or get familiar with the other rewarding features. To get some valuable tips, make sure to read the Hunting Treasures slot review. We have no free play mode available yet, but take a look at the Hunting Treasures screenshots instead. Or why not simply giving a try with one of the recommended casino sites above? The gamplay is simple: get paid for 3 or more matching icons or use a Wild to substitute a missing one. Mermaid is a symbol with the highest rating and brings 200 coins on the paytable when you collect 5 of the kind. A giant octopus attacking your ship is the scatter and you have to collect 3 or more in order to start the Hunting Treasure Free Spins round. You’ll receive 10 spins and a Win Multiplier of 5x. During this round, each win will activate Shifting Reels that will make the reels move up or down to help you form more winning combinations. While those reels are spinning, you can get 4-12 Extra Wilds and land a big win. Before any spin, you can set the coin value that goes from €0.01 to €10 and wager between €0.50 and €500, according to your betting strategy. With 3+ Bonus symbols, you’ll trigger the Hunting Treasures Bonus game and start exploring the ocean with compass and map. There are 4 glowing locations, so visit them all to pick your prize. Built completely in the HTML5 technology, this is a title that you can play online on all mobile devices without a need to download an app. Spinomenal-powered sites offer demo mode where you can play for fun too. 3. What is the RTP factor of Hunting Treasures? The RTP goes between 95.35% and 96.68%, according to the statements of recent winners. Re-triggerable free spins with multiplied winnings and a chance to score much more with a fresh dose of Wilds should definitely sound quite appealing, no matter of your previous gaming experience.